Pterostylis saxicola D.L.Jones & M.A.Clem. Rosette leaves 5–8, obovate, 1–2.5 cm long, 7–11 mm wide, margins entire. Scape to 25 cm high, with 2–4 closely sheathing stem leaves. Flowers 2–10, c. 1.3 cm long, transparent with dark red-brown markings and suffusions, semi-erect. Dorsal sepal with an upcurved filiform point c. 3 mm long. 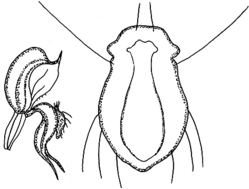 Lateral sepals ovate in outline when flattened; conjoined part shallowly concave, margins strongly incurved, glabrous; free points filamentous, c. 5 mm long, curved forwards, divergent, 10 mm apart at the tips. Petals with a poorly developed proximal flange. Labellum broad-obovate, c. 5 mm long, c. 3 mm wide, dark red-brown, grooved; marginal trichomes 3–5 pairs, 2–3 mm long, white; basal lobe large, with 2 or 3 pairs of trichomes c. 0.7 mm long. Distribution and occurrence: Grows in shallow soil over sandstone sheets, often near streams; rare, from Picnic Point to Picton area.